Buckeyes are a Midwest Christmas tradition that both our families enjoy. They are designed to look like the seeds of the Ohio buckeye tree and are quite popular during the holidays or during the Ohio State University football season. I have made the traditional recipe for years, then this year I decided to darken things up a bit by adding some good bittersweet chocolate, and the new recipe was a hit. I usually make two batches of this, but I do the batches separately. I’ve had trouble fitting a double batch of the peanut butter mixture ingredients in my 4-1/2 quart mixer bowl without making a huge mess, but if you have a large mixer bowl it might not be a problem. Combine peanut butter, sugar, butter, and vanilla in mixer bowl. Stir until blended, mixture will be slightly dry. Roll mixture into 1-inch balls and place them on prepared cookie sheets. Stick a toothpick in the top of each peanut butter ball. You’ll use this “handle” later for dipping. Freeze the balls for about 30 minutes, until hard. Pour semi-sweet and bittersweet chocolate chips into glass bowl. Add the butter. Microwave 60 seconds at 70% then gently stir. Microwave for 30 seconds at 70% and stir, repeating until the chocolate is almost but not completely melted. Do not overheat. You don’t want the chocolate to be completely melted in the microwave. If you’ve done it right, the last few stirs will mix in the remaining firm chips. Dip the peanut butter balls into the chocolate, leaving a circle of peanut butter showing on top. 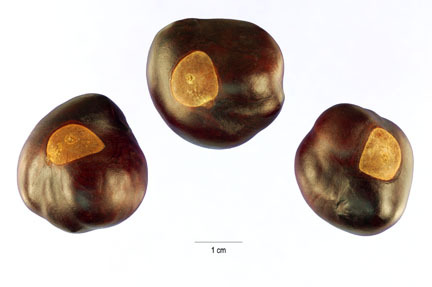 They should look like buckeyes (see photo below). Place the dipped balls back on the cookie sheets. Refrigerate finished buckeyes for at least 2 hours. Remove the toothpicks and store in tins between layers of wax paper. I have tried this recipe (minus the vanilla) your way, and my mother-in-law’s way, which is to mix 12oz. of choco chips with 1/4 cake parafin (I used Gulf wax). This parafin makes the chocolate set much better and harder, like “real” candy. Without it, the chocolate tends to melt and be more “gooey”, and not cling to the PNB balls as well. Try it, and let me know what you think! I think you’ll agree with me! I agree about the wax…..I use Gulf Wax for the same reason. Can’t ever get the chocolate to melt right if I don’t use it…..trust me I’ve tried, and it’s just not the same. While I have never made Buckeyes, I make a lot of chocolate dipped confections. Today I made Oreo Truffles. I never use parafin. My mother always did when I was a kid and I hated the waxy texture and taste. I melt half milk chocolate and half semi-sweet chocolate chips together and never have any problem with dipping. It works on the Oreo Truffles, Chocolate Chip Cookie Dough Truffles (YUM!! ), cake balls, whatever. It sets up and hardens perfectly every time. 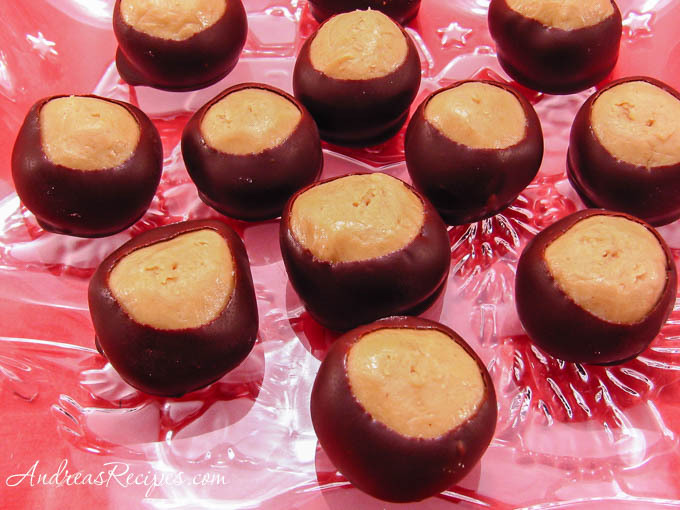 These were the best buckeyes that I ever made..
To get the chocolate to stick to the peanut butter, my Mom would roll the balls in powdered sugar before dipping in the chocolate. Also my Mom never added anything to the chocolate.